My model railway, The End of the Line represents the distribution point of a small coal mining operation in the early 1960's. Never very busy, the output of the mine is divided between distant industry, transported by rail and local demand which is handled by road haulage. 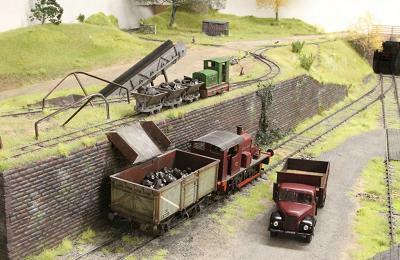 The coal from the pit head ls delivered to the yard by a 2 foot narrow gauge railway. The excellent KB scale tipper wagons have been made to operate and discharge their load onto a conveyor or direct into a waiting standard gauge mineral wagon. 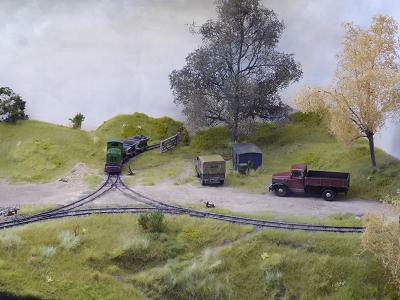 Narrow gauge and standard gauge locomotives are mainly kit built but there are also some 3D printed bodied models from Shapeways and ready-to-run models from lxion and Bachmann Brassmasters. The layout has a scenic area of 5 feet by 3 feet. The grass is a mixture of Polak and MiniNature static fibres. Control of locomotives is by DCC as is the operation of a very heavily modified Hornby motorised conveyor and the Tortoise point motors. Road haulage lorries are radio controlled and have been converted from commercially available die-cast models. They are powered by a replacement battery for an iPod Nano, a motor gearbox designed for miniature robotics and a micro servo for steering. The control is by a Deltang receiver under the bonnet and a controller/transmitter from a toy indoor helicopter. 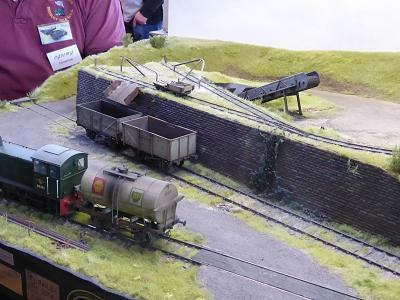 The layout was originally built by Giles Favell but the stock and the lorries shown today are by the current owner.